Our Vision: To reach the youth of our community with the gospel of Jesus Christ; to teach them what God wants from their lives, through strong insightful Bible study; and to prepare them to walk with God, in life, after high school. Sunday Morning Bible Study is built with the idea of challenging the youth to have a personal walk with Jesus Christ through the life changing experience of salvation, and by teaching them personal responsibilities in life from the Bible. Youth Ministry is held on Sunday evening with the purpose of helping the youth to see life and ministry beyond themselves. 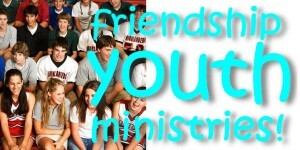 They will be encouraged as a group to reach out to the community through different means of ministry. All of this will be done from strong Biblical teaching. * For Spring 2013, the M.I.S.S.I.O.N. group’s focus will be a study through the book of Acts-Various activities that coincide with the passage. F.O.C.U.S. Group is held every Wednesday evening with the purpose of opening the Bible and discussing today’s current issues which youth are dealing with. It will be a time of showing our youth how to look at different areas that challenge the Christian faith and where to go to answer those questions. It is also mixed with a time of fun.